Meconium is the first stool of an infant. Sometimes this stool is passed into the amniotic fluid that surrounds the baby in pregnancy. 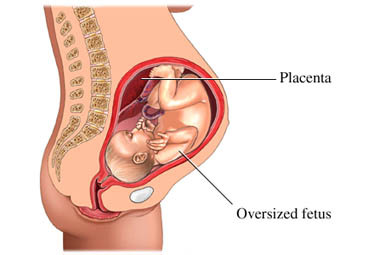 Meconium aspiration is when the meconium is inhaled into the baby’s lungs. Meconium aspiration syndrome (MAS) is a set of symptoms that may result from meconium inhalation. Not all infants who inhale meconium will develop these symptoms. It is not known why some infants develop MAS and others do not. You will be asked about your baby's symptoms and medical history. A physical exam will be done. Tests may be ordered to look for complications or causes. Meconium aspiration may not cause serious problems. Your doctor will monitor your baby. Other treatment may not be needed. If your child is not vigorous in the delivery room the doctor may need to intubate your child to remove meconium from the trachea (breathing tube). Supportive care may be needed if the aspiration is causing breathing difficulty. Your baby may need to be monitored in a neonatal intensive care unit (NICU). MAS can lower the amount of oxygen to your baby’s body. Your baby may be given oxygen in the delivery room. The oxygen will be given through a mask or a hood that fits over the baby’s head. This will improve the amount of oxygen in the body by making more available in the lungs. The therapy may be continued if your baby continues to have problems breathing. Your baby may be given IV fluids to control blood pressure and glucose levels. Your baby may be given medication. The medication will coat the lungs and help clear the airways. This will also help your baby’s lungs mature. Other medication may include antibiotics or heart medication. A special gas called nitric oxide may also be added. This gas can help open the blood vessels in the lungs. This will let more oxygen enter the body. In some cases, your baby may not be able to breathe properly on their own. Mechanical ventilation may be used to help your baby breathe. Manage chronic conditions. This includes high blood pressure, diabetes, respiratory disease, and heart disease. If you smoke, talk to your doctor about how you can quit . Meconium aspiration. Kids Health—Nemours Foundation website. Available at: http://kidshealth.org/parent/medical/lungs/meconium.html. Updated October 2014. Accessed September 25, 2017. Meconium aspiration. Lucile Packard Children’s Hospital website. Available at: http://www.stanfordchildrens.org/en/topic/default?id=meconium-aspiration-90-P02384. Accessed September 25, 2017. Meconium aspiration. University of Rochester Medical Center website. Available at: http://www.urmc.rochester.edu/Encyclopedia/Content.aspx?ContentTypeID=90&ContentID=P02384. Accessed September 25, 2017. Meconium aspiration syndrome. EBSCO DynaMed Plus website. Available at: http://www.dynamed.com/topics/dmp~AN~T116582/Meconium-aspiration-syndrome . Updated July 31, 2017. Accessed September 25, 2017.